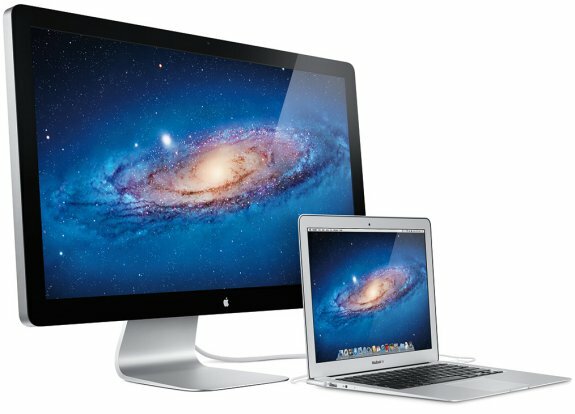 Apple revealed world's first 27" Thunderbolt display. Price is $999, yuck. Apple today unveiled the new Apple Thunderbolt Display, the world’s first display with Thunderbolt I/O technology and the ultimate docking station for your Mac notebook. With just a single cable, users can connect a Thunderbolt-enabled Mac to the 27-inch Apple Thunderbolt Display and access its FaceTime camera, high quality audio, and Gigabit Ethernet, FireWire 800, USB 2.0 and Thunderbolt ports. Designed specifically for Mac notebooks, the new display features an elegant, thin, aluminum and glass enclosure, and includes a MagSafe connector that charges your MacBook Pro or MacBook Air. The Thunderbolt Display includes an ambient light sensor which automatically adjusts the display brightness based on external lighting conditions and uses only as much energy as necessary to provide an optimum viewing experience. Made with mercury-free LED technology, arsenic-free glass and highly recyclable materials, the new display meets Energy Star 5.0 requirements and achieves EPEAT Gold status. The new display contains no brominated flame retardants and all cables and components are PVC-free.